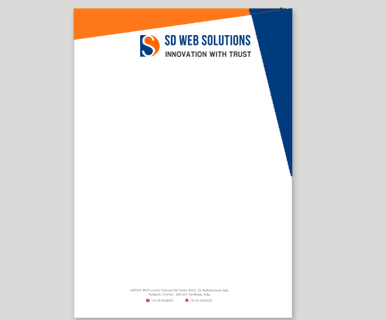 SD Web Solutions is a good Letterhead Designing company in Delhi. Letterhead is a communication piece, which should represent your brand identity and stationary and also provides an important addition to brand’s image, with a simple and careful placement of its logo and corporate design. If you want to design a letterhead you need to have company logo, contact information such as address, phone number, email address and fax no. It shows a certain level of professionalism and consistency. Best Business Letterhead Design Services are providing by the Kool Design Maker which is one of the Best Letterhead Design Company. The corporate business field is all about developing first positive impression. From the office appearance to business services and from the staff to stationery each of them plays separate and imperative role in pumping your market value and credibility of the brand. Letterhead designs are also much important in the business promotion. It is also known as the company’s representative that contains business name and its logo design as well as other important stuff that represents company’s professionalism.